History of swords and armor. Types of swords and armor. Sword info. History of fantasy swords. Famous fantasy swords. List of fantasy swords. Excalibur and other fantasy swords. Swords naturally play a central role in stories of a fantastical nature. In such settings, it is common for the swords to be named, hold great renown in the realm and be imbued with magical powers or represent something of great importance. This was demonstrated in the fantastical legend of King Arthur of Britain, in which two swords play a key role in Arthur’s life. The first is the story of the Sword in the Stone. This part of the legend revolves around the true successor to the throne of England. 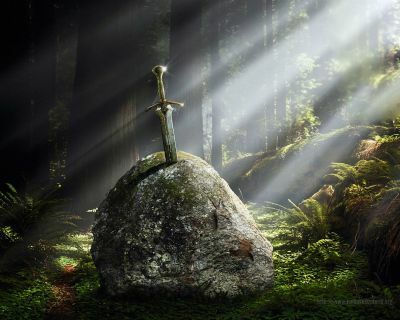 The story goes that the sword was driven into a stone by Uther Pendragon and so would remain until removed by his true heir, the rightful King. Though many brave knights attempted to pull the sword from the stone, none but Arthur could do so, demonstrating that he had been divinely appointed to rule the Britons. The second is the story of Excalibur. This powerful sword was given to Arthur early in his reign by the mysterious Lady of the Lake, to guarantee Arthur’s strength during his reign, though some versions of the legend have Arthur breaking the sword during his first encounter with Lancelot, to be repaired by the Lady of the Lake. Because of the multi-faceted nature of the Arthurian legend, many details surrounding these two swords have been lost, including whether the swords were actually the same one. However, despite the fictional nature of the Arthurian legend, Excalibur remains one of the best known swords in fantastic literature. Fantasy swords and Movie swords for sale. This entry was posted in Swords. Bookmark the permalink.